Set in the heart of the trendy Nørrebro district- a former working class neighborhood that has recently been gentrified to a hipster haven, Manfreds & Vin is located Jægersborggade a quiet street lined with coffee roasters, craft beer joints and chic eco conscious boutiques. Run by Christian F. Puglisi and Kim Rossen, the team behind Michelin starred Relæ, Manfreds started out as a cozy wine bar and grew to become one of the neighborhoods most revered restaurants. Locals come for the Chef’s delicious and creative seven course tasting menu that changes nightly comprised of locally sourced seasonal vegetables, seafood, meat and cheeses served in an informal and homey atmosphere with a vast selection of organic wines. As the younger sibling restaurant to the famous Michelin 2 star rated AO C, the architecturally striking No 2 is located directly on the waterfront of Christianhavn with breathtaking views of the futuristic Black Diamond and Circle Bridge. Just like the modern setting of the restaurant, Soren Selin, the co owner and chef de cuisine of AOC, prepares contemporary Nordic cuisine served in a more simplified but still visually stunning preparation with the seven course tasting menu displaying his breadth of talent. 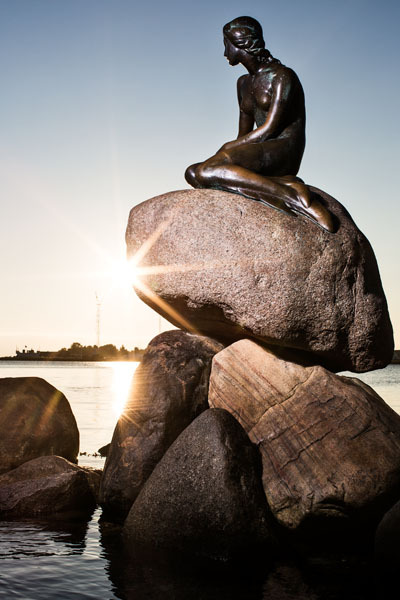 Unveiled on 23 August 1913, ‘The Little Mermaid’ was a gift from Danish brewer Carl Jacobsen to the City of Copenhagen. The sculpture is made of bronze and granite and was inspired by Hans Christian Andersen’s fairy tale about a mermaid who gives up everything to be united with a young, handsome prince on land. Every morning and evening she swims to the surface from the bottom of the sea and, perched on her rock in the water, she stares longingly towards the shore hoping to catch a glimpse of her beloved prince. Carl Jacobsen fell in love with the character after watching a ballet performance based on the fairy tale at the Royal Danish Theatre. The brewer was so captivated by both the fairy tale and the ballet that he commissioned the sculptor Edvard Eriksen to create a sculpture of the mermaid. Eriksen’s wife, Eline Eriksen, posed for the sculpture. Please note that you have to ask for permission to use photos of The Little Mermaid. Please e-mail information to eriksen@mermaidsculpture.dk. Find more information here: http://www.mermaidsculpture.dk. Specializing in natural organic Nordic cuisine, Restaurant Radio is an informal yet modern and airy restaurant located near the Forum Copenhagen and the old Radio house in the hip Fredericksburg neighborhood. Chef Jesper was formerly the sous chef at Noma and wanted to create a menu using unique ancient grains and legumes sourced from organic farms just outside of Copenhagen paired with local seafood and meats. Veteran restaurateur and owner Claus Meyer plans to bring the fresh flavors of Nordic cuisine stateside with the Nordic Food Hall & Brasserie opening Spring 2016 in the Grand Central Vanderbilt Hall in NYC. A visit to Copenhagen wouldn’t be complete without stopping in the magical Winter Wonderland of Tivoli Garden, which was the inspiration and precursor to Walt Disney’s Disneyland. Kähler restaurant combines the best of traditional Danish cuisine and design. The setting has a 70s post modern vibe where the architecture, furnishings and place settings were created by some of Denmark’s most renowned designers such as Verner Panton, Le Klint, and Arne Jacobsen as well as Kähler. Try the seasonal 3 course Christmas dinner with venison, pork loin and a Danish “snowball” to get into the holiday spirit. Located behind in a picturesque courtyard behind Royal Copenhagen and Georg Jensen off of Copenhagen’s main shopping street is the Royal Smushi Café. If Eloise were to meet Alice in Wonderland this is the fairy tale setting they would create for their tea party- part fantasy yet pure elegance with angelic feather plumed lighting, large tables for sharing, and shelves full of curiosities for sale. The specialty is the selection of smushi- a smørrebrød which is the traditional Danish open faced sandwich inspired by sushi with Danish flavors presented in artistic delicate bite sized portions. Of course the Danish pastries and cakes are quite delectable as well. Gourmet hot dogs, champagne and cocktails, need we say more? 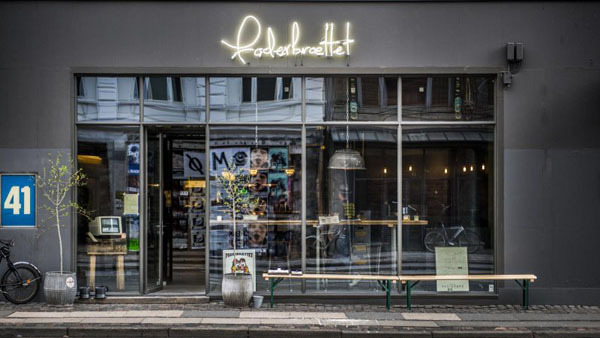 As hot dogs have gained popularity in Denmark, Foderbraettet has created elevated versions of this favorite fast food such as a Korean shrimp hot dog, a smoked bacon dog with Danish cheese, and wild boar sausage topped with marinated pumpkin. Set in the uber trendy Vestebro neighborhood, Foderbraettet is open until 2 on weekends and turns from a popular casual dining spot to a late night party lounge with refreshing seasonal cocktails and a DJ spinning the latest Euro EDM. Just under 10 years ago, founder Mikkel Borg Bjergso was a physics teacher and beer geek experimenting with hops, malt and yeast in his kitchen to create uniquely flavored beers. 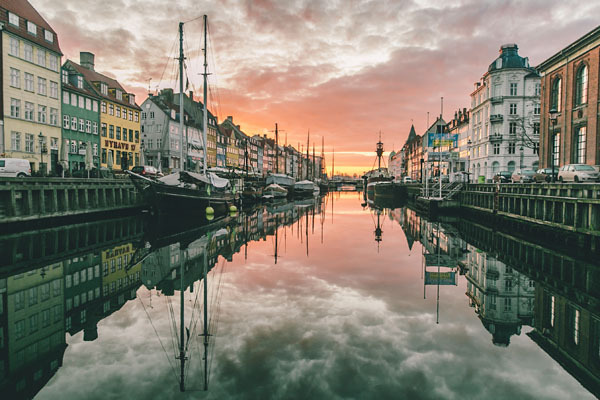 Today he has a microbrewery that exports to over 40 countries with several outposts in Denmark as well as international locations in San Francisco, Tokyo and Bangkok. The Mikkeler bar in Vestebro is where it all started and serves as its microbrewery location serving over 100 varieties of rare and limited run brews. Touted as one of the best bars in the world, Ruby’s feels more like hanging out at a wealthy friend’s luxe abode with that private club ambiance like Norwood or Soho House but without the membership hassle. Without any frontal signage, Ruby’s is located in a townhouse dating back to 1740 in the historical center of town. The resplendent setting has mahogany wood paneled walls, sumptuous Chesterfield leather chairs and banquettes with huge bay windows overlooking the canal, where the elegance is only matched by the throngs of beautiful people filling the space. Street art, yummy interior design and a menu void of regulations all come together to form Madklubben Nørrebro. A true neighborhood spot with a bustling atmosphere on a Tuesday as well as a Saturday. Let the 4 meter tall ”Madklubben” neon sign guide you through the passageway to the courtyard and Madklubben Nørrebro furnished with a mix of stylish Danish design icons and rustic architectural details from the venue’s warehouse past. 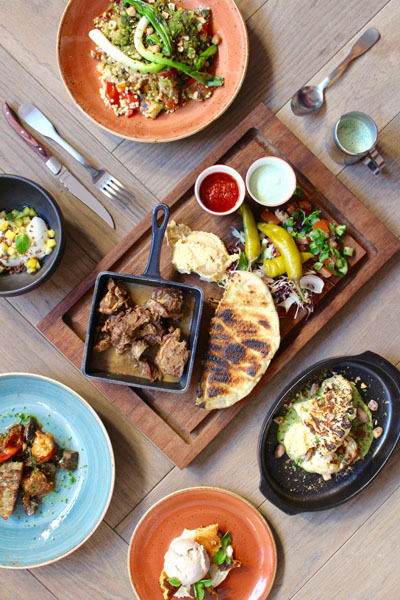 Just like the district of Nørrebro, the menu wants do do it all while still maintaining a special love for the Middle Eastern cuisine. Once you enter the restaurant you’ll easily spot our enormous charcoal grill, which is the beating heart of the open kitchen. It’s used to cook everything from scrumptious shawarma to burger patties and tempting vegetable dishes. A three course menu starts from as little as DKK 200. As the sister bar to Rubys, Lidkoeb is probably the best place to meet, er pick up a Dane. Set in a former pharmaceutical factory in Vestebro, the sprawling 3 floor space is located at the back of an open air courtyard that accommodates the overspilling crowd. The bottom two floors are warmly decorated in modern and luxurious Danish furnishings with large leather banquettes and a long bar conducive to making new friends and acquaintances at this packed hotspot. For a more intimate setting head to the third floor whiskey bar with exposed wood walls and beamed ceilings and sumptuous vintage leather seating. Serving only whiskey, get your drinks from the “Dispensing Chemists” labeled bar serving extremely rare vintages to mixed cocktails, and to ensure the cozy atmosphere this is the only floor with a bouncer to keep crowds at bay. Cocktail culture is alive and well at 1656. Set on the nightlife border of Vestebro and the Meatpacking district finding 1656 can be tricky. Designed as a consummate speakeasy, the entrance is behind a graffiti marked metal black door with an Old World ambiance created by dim lights, leather Chesterfield banquettes and dark wood paneled walls with a hidden sub speakeasy Tiki Bar hidden behind a velvet curtain. Talented mixologists create a new menu each season of potent concoctions with a modern take on classic cocktails with old world ingredients such as chartreuse, falernum, and absinthe mixed with seasonal ingredients. The cozy Polynesian themed Tiki bar serves elevated versions of potent rum based drinks such as Planters punch or Pina Colada that feels like a throwback to Trader Vics.